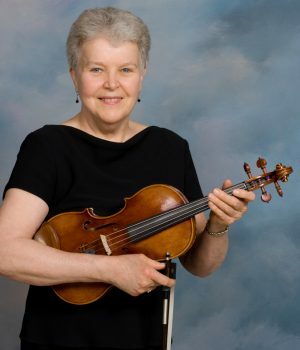 Patricia (Pat) Vary has played with the Kishwaukee Symphony Orchestra since 1991. She started playing the violin in the 4th grade and took lessons from Professor Harold King at Southwest Missouri State University for 8 years. She studied under Sam Terranova, concertmaster of the Shreveport, Louisiana, Civic Symphony as a high school senior and played in the symphony. While in graduate school in Madison, Wisconsin, she studied with Marie Endress at the American Conservatory. She was a member of the Texas Christian University Symphony during college and the Stanford Chamber Orchestra while in graduate school there. She also plays a mean harmonica and occasionally her bugle. Pat’s non-music education was in the sciences. She has a B.S. degree in Medical Technology and an M.S. degree in Science/Medical Microbiology, both from Texas Christian University, an M.S. in Biochemistry from the University of Wisconsin, and a Ph.D. in Microbial Genetics from Stanford University. She was on the faculty of the Department of Biological Sciences at Northern Illinois University for 28 years (and department chair for four of those years). She achieved the title of Distinguished Research Professor, holds two patents, has published over 100 papers and abstracts, and had a licensing agreement with a major pharmaceutical company. Pat recently retired. Pat’s favorite activities are gardening, bicycling, travel, reading, and movies. She is now delighting in five grandchildren. She is involved in the community and served on the DeKalb County Board for 10 years. She loves music and sings in the Bread & Roses women’s chorus. She was also a director of a children’s choir at her church for several years. Her favorite composers are Haydn, Prokofiev, and Debussy for the variety and richness of their music. One of her special memories of the KSO is the blackout at the first concert after conductor Art Montzka’s death, in which the orchestra managed to finish the piece without being able to see the music. All she could think of was that this was Art’s sense of humor shining through to all of us. She is thankful for the support of the Kishwaukee Symphony Associates (KSA), the orchestra patrons, the KSO Board, and the players for making it possible to continue to play and interact with many young students. She is grateful for the musicianship of Music Director Linc Smelser in guiding the KSO toward both individual and collective improvement and enjoyment of wonderful music.